Just got these back from PSA. The Camals and Vicejoy are upgrades for me, and the Cover Ghoul and Breadcrust are extras. I also got back a Chocked #5 that got a PSA 5. Very pleased with the Camals 8.5! Nice going! I don't follow PSA closely, when did they start doing decimals? Doesn't that erode the whole grading number process ie a previously graded PSA8 really would have qualified for a PSA8.5 and now it is considers a laggard to PSA8.5? Will they soon start implementing 1/4 point grades? I sure am glad I bought that lot of raw die-cuts a year or two ago! That also yielded the Skimpy #15 that got an 8. As for PSA, I don't know if the decimals are a new thing, but I'm pretty sure they only do it for 8's and 9's. they will do the have grades at any number. I have gotten 6.5's before. The half grade was brought about for the card that looks better than the base grade but not good enough to be the next grade. Pat, nice edition to your 67 Set. You soon will be in the top 5! I just got these two back today from PSA. Awesome! It's tough to find Ads without creases or other flaws that are automatic downgrades. You have some beautiful ads. Looking foward to start grading some stuff hopefully soon. If there are any tips before I send them in would be helpful. I'm a newbie in the grading game. before you spend your money on grading get really good at noticing flaws. When sending in a card, be totally objective. Do not hope they will let something "slide", because they won't. I grade all my cards and write down what I think the grades will be when I get them back. I then compare it to the actual grades and see what I missed. I have moved more to the conservative side, as I am getting higher grades then what I wrote down. ( some would say that is good, but it just costs me on not sending cards that could grade) Therefore I go back over them and re look at them to send in. Also send in bulk so your cost per card does go down. Another thing if you are sending base wackys make sure the value is there. Or in other words make sure the juice is worth the squeeze. It really does you no good to send in a 1979 reprint and get a 9 and only be able to sell it fore 4 bucks. Make sure unless you are independantly wealthy you are choosy on what is sent. I agree with what Joe advised. As for some specific flaws to really look for, be aware that PSA automatically downgrades for roller marks, so otherwise great stickers are likely to get disappointing grades. You also have to check for miscuts - they won't even grade those. I acquired these two over the years already graded. The Good and Empty is a treasure in and of itself. There is smudge on the bottom right corner - who cares - in that being said, try to find one - in my quest my completion-ism, it is better then no card at all. I agree with Rawgoo - Be mindful of what you send and the money involved - I was lucky enough to recently acquire a Cracked Animals Die-Cut - THAT you send to PSA for protection it is legit and to protect from little sticky grandchildren hands (HAHAH) and to have an idea of it's real value. 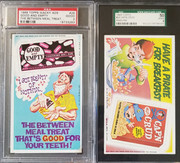 The way I look at Ads and die-cuts, they are very prone to accidental damage, and are safer in PSA holders, making them decent candidates for grading even if you know they'll get lesser grades. I knew my Cracked Animals would grade a 6 if I was lucky, but am still happy to have it graded as a 5, and now I can handle it without worry. I just got back a Chock-Full-Of-Nuts die-cut #5, knowing it would grade as a 5 or 6, but seeing as how it is the tough variation, it seemed worth it, even though I already had a graded PSA 5. So, now I have an extra PSA 5. For some reason my ads are the one thing I never submitted to PSA. I think I just didn’t know how they are supposed to be classified so I just put it off. Joe, can you spell out exactly how you are supposed to submit these? Oh, so you submitted your packs to PSA? I always submitted them by themselves , as they had to go together with like ones. I sent a lot of 15's (15 free) and this last bunch of three was the reward for completed registry sets yearly. I did do one batch of 50 in the beginning. I think that was what you were looking for, as I know you have a better "eye" for this than I do. They charge the same for them as reg cards. Just have to have them together. What type of card are they considered? Tall boy? that is what I considered them. When I called to ask that is the description that i used. I've been told that PSA doesn't charge any more for Wacky Ads than for regular cards. Sorry to be dense, but when you're filling out the submission form, there is no need to specify that they are tall boy, different sized, whatever....you just describe the cards in the same way as always? In short, there is no difference in filling out the sub form for wacky ads than for normal sized cards....true? Also, what did you send them in? Are there card savers that big? I guess card saver III seems to be large enough. I use card saver 4 on all of my wacky ads gives them more room and I don't have to force them in. Thanks for the info Joe. Depending on how many really nice ones I have I might use my renewal subs for these. That's what I used my last two renewals for. Thing about wacky ads is they are so dam hard to get good grades. A "6" really is a good grade on those. Finding an "8" is like having a 9-10 in regular cards. They are very picky on the stress lines around the punch out. I would send in any that don't have them and realize that a six And above are the grades you should shoot for. Here are the last 2/5 ads submitted... happy they came back at 7's ! Me too Pat, I was hoping that they would have started making those distinctions at this stage in the game ! I did like the quick turn around only 2 weeks but, a bit pricey ! Those ads are fantastic! I’m going through my set tomorrow, many are very nice but centering does vary. I hope i have a bunch of nice ones. I haven’t looked at them for years. I finally have one of these! I wish you all the best with yours Dave may the PSA gods treat you well ! I'm happy to see it came back as authentic for you Richard ! Those Wacky Ads and that Cracked Animals are great! I never see Good and Empty's on here. Very nice. This Hungry Jerk isn't a new acquisition either, but I finally got PSA to correct it to say Series 3, instead of the previously mislabeled Series 5 tag.